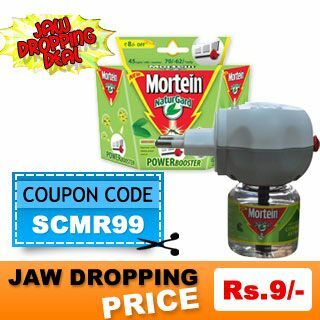 Hello Friends we are here with an exciting new offer from shopclues offering Mortein Mosquito Repellent Refill+Machine in just 18 Rs. You Can Share This Information with Your Friends on "Facebook" and "Twitter" with the Help of SHARE and TWEET Button and Don't Forget to GIVE YOUR VALUABLE COMMENT ...! !